Last night’s meeting with Col. Fazeel was productive and encouraging. He started off by recommending categorically that I take the bus, but during the course of the conversation, once he realized how determined I was, and how much I’ve already come through, he changed his mind completely, told me that I’d (probably) be fine to tackle the stretch of the KKH between Mansehra and Chilas, and started giving me advice on where to stay, where the road surface gets really bad, where to look out for landslides, and where I’d be out of phone signal and therefore unable to summon back-up in case something did go wrong. He assured me that he’d make arrangements for me to stay somewhere safe in Gilgit, and that I’d be perfectly safe from then on. I went to bed with my mind made up. But today my head’s been swimming with doubts, and I’ve been coming to a different decision every five minutes. Everyone I’ve consulted or discussed the matter with has a slightly different opinion, most of them negative. “You do realize,” said my journalist friend, “that almost everyone who gets kidnapped gets killed?” (Like British aid worker Khalil Dale, in fact, whose body was recovered in Quetta last week.) He asked if I had an escape plan. I don’t. How could I realistically hope to get away from armed captors and survive in unfamiliar territory long enough to get back to civilization without being recaptured and/or shot? For the very first time, I felt a cold shudder of actual fear. It wasn’t pleasant. But then – a Dutch cyclist I met a few weeks ago decided to ride through Kohistan and made it to Gilgit in one piece, although he had to scramble over a landslide to get there. So not only do I know that it’s possible – I also have something to live up to. And then again – it’s different if you’re female. So far I feel that travelling on my own as a woman has been more of an advantage than anything else. It brings out people’s protective instincts. Most of the time I think I’m actually safer than a man travelling alone, or even than a couple. But this is an area populated by ultra-conservative fundamentalist Muslims. Laura Stone’s excellent and comprehensive guidebook to the area states that Foreign women should not ride the section between Besham and Chilas alone. And, judging by the rest of the book, she knows her stuff. 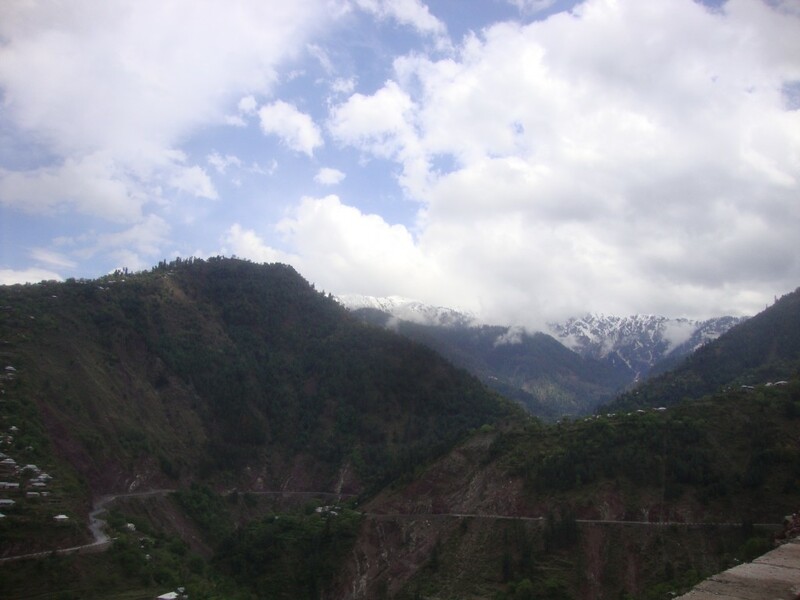 Then again – Loretta Henderson passed through Kohistan on her way south last year, and survived. So it can be done. Whether it crosses the line between courage and folly is another matter. On a personal note without wanting to patronise I would advise you to think very carefully about going, the situation at the moment is particularly unstable in the northern areas and you are very noticeable on a bike and vulnerable by yourself. And he asked for my next of kin. The FCO website advises against travel in the area. I haven’t paid them much heed in the past (I was amused to find, after loving and leaving Bam, that they actually advise against all travel to the city), but this all added to the general sense of doom and doubt swirling around in my head. And, more worryingly, they reckon foreigners stand little chance of getting into Gilgit without an NOC (No Objection Certificate) from the government. My friend Col. Fazeel reckons that this wouldn’t apply to a cyclist, but since Dad and I have already been turned back at the border of Kashmir for want of one of these pesky certificates, I’m disinclined to walk (ride) into another such obstacle. Maybe it would be better to try and sneak through on a bus instead. Oh and if you haven’t 100% decided then I think that bus to Gilgit sounds like a good bet. You’ve already broken your continuous link in Pakistan, so it’s just more of the same. Considering the security situation I think it’s the best option and it will also give you more time and energy to explore the upper stretch of the KKH ie Shimshal etc. Also, it’ll give you time to start experimenting (slowly) with altitude impact. Seems very clear to me – what do you think ? What do I think? Oh, if only I knew! Since the police stopped me from cycling in Balochistan, this trip is no longer an unbroken line around the world. But, until now, I’d decided that I would always cycle unless actually stopped from doing so by the police – i.e. if the decision was taken out of my hands. I’m not sure if this applies so readily to Kohistan though. There won’t be so many policemen around, for a start. And those that I do encounter may well suss out my lack of NOC and simply not let me go any further – and then I’m really stuck. On the other hand, several daring cyclists have already made it through this year, and I’ve always wanted to be one of the daring ones, rather than one of the gave-in-and-took-the-bus ones. (And would I actually be safer on a bus anyway?) Maybe I will ride through Kohistan, and maybe it’ll be fine. On the other hand, think how I’ll regret it if I’m kidnapped and murdered. And after all, as with so many of these hostile territories (Balochistan included), Kohistan won’t actually be a very enjoyable place to ride – by all accounts it’s hot, dusty and fairly uninteresting. Maybe Dad’s right, and I should save myself for the friendlier and more picturesque upper stretches of the KKH. Most of the climbing happens after Gilgit (1495m), anyway – and I’ve already made that detour into the Kaghan Valley, and climbed up to Shogran (2363m), which puts me a bit ahead in terms of altitude and mileage, if not on the exact route I was planning. Long and short of it is, I still have no idea, and I should be setting off tomorrow, once I’ve picked up my Chinese visa. I’m going to sleep on it, and hope that inspiration strikes (and settles) in the night – or that someone comes along and says something that manages to make my mind up. And oh! How I long for wide open spaces with no borders, and for endless empty roads with no one to stop me from riding on them! I wonder where – eventually – I’ll find them.